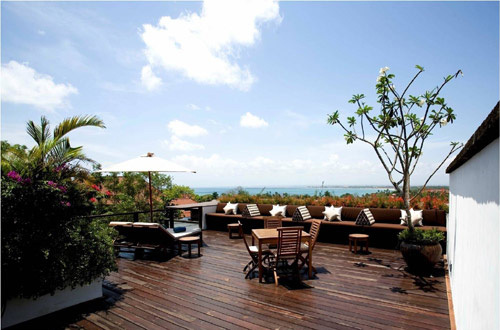 Location in Jimbaran, 15 minutes drive from airport , luxury villa, brand new and modern. Featuring modern luxury architecture and interiors, The Temple Hill villas offer you from the moment you enter the villa complex, you have entered your own private paradise. Magnificent 7-suite villa is uniquely modern designed and decorated with impeccable attention to detail. It is amongst beautiful manicured tropical gardens, and infinity pool, all enhancing the tranquility of your vacation environment. Temple hill villa offers outstanding accommodations with a professional and friendly staff to serve your every need. You will find this villa elegantly appointed with every amenity a 5-star villa has to offer. There are 7 luxury modern villas each on their own level ensuring maximum privacy for your total relaxation and comfort. Each villa is individually decorated with its own elegant color scheme. 2 Villas each villa set with 600 square meters spacious modern living area facing the marvelous Ocean views. The perfect accommodation for family vacation, friends together, small corporate group or even for the honeymooners. Villa C2 - This modern villa featuring a large private swimming pool, spacious living and dining room, four bedroom of king size bed, fully equipped designed kitchen, state of the art entertainment system (DVD/CD player/LCD TV, Multi channel television), Luxurious interior with unique Balinese traditional touch, beautiful manicured garden, bale bengong (day bed) and spacious car garage. Villa Magna - This modern villa featuring a large private swimming pool, spacious living and dining room, four bedroom of king size bed, fully equipped designed kitchen, state of the art entertainment system (DVD/CD player/LCD TV, Multi channel television), Luxurious interior with modern touch, beautiful manicured garden right out your door, bale bengong (day bed) and spacious car garage. Villa C1 - The C1 villa offers 545 square meters spacious modern living area surrounded with the marvelous Ocean view, consist of three bedrooms villa. The perfect accommodation for family vacation, friends together, small corporate group or even for the honeymooners. This modern villa featuring a large private swimming pool, spacious living and dining room, three bedroom of king size bed, fully equipped designed kitchen, state of the art entertainment system (DVD/CD player/LCD TV, Multi channel television), Luxurious interior by Gill Wilson, well manicured garden, and spacious car garage. Villa D5 - The D5 villa offers 435 square meters spacious modern living area facing the magnificent Ocean view, consist of three bedrooms villa. The perfect accommodation for family vacation, friends together, small corporate group or even for the honeymooners. This modern villa featuring a large private swimming pool, spacious living and dining room. Gorgeous hardwood floors and pleasant reading area. Easy access to the upper level living and lounge area for really enjoyable night time relaxation or sun bathing during the day, fully equipped designed kitchen, state of the art entertainment system (DVD/CD player/LCD TV, Multi channel television), Luxurious interior with modern touch, well manicured garden, bale bengong (day bed) and spacious car garage. Villa D2 - The D2 villa offers 460 square meters spacious modern living area facing the magnificent Ocean view, consist of three bedrooms villa. The perfect accommodation for family vacation, friends together, small corporate group or even for the honeymooners. This modern villa featuring a large private swimming pool, spacious living and dining room, three bedroom of king size bed, fully equipped designed kitchen, state of the art entertainment system (DVD/CD player/LCD TV, Multi channel television), Luxurious interior by Gill Wilson, well manicured garden, bale bengong (day bed) and spacious car garage. Villa Jacinta - The Jacinta villa offers 460 square meters spacious modern living area facing the magnificent Ocean view, consist of three bedrooms villa with one of twin bed and two of king size bed. The perfect accommodation for family vacation, friends together, small corporate group or even for the honeymooners. This modern villa featuring a large private swimming pool, spacious living and dining room, fully equipped designed kitchen, state of the art entertainment system (DVD/CD player/LCD TV, Multi channel television), Luxurious interior by Gill Wilson, well manicured garden, bale bengong (day bed) and spacious car garage. Villa Segara - The Segara villa offers 240 square meters spacious modern living area facing the magnificent Ocean view, consist of two bedrooms villa. The perfect accommodation for family vacation, friends together, small corporate group or even for the honeymooners. This modern villa featuring a large private swimming pool, spacious living and dining room, fully equipped designed kitchen, state of the art entertainment system (DVD/CD player/LCD TV, Multi channel television), Luxurious interior with modern touch, well manicured garden. High season period: July 20 - August 31.